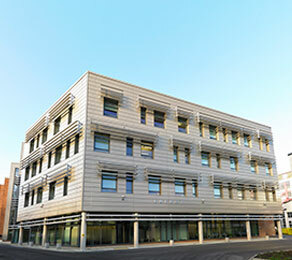 Leeds University has a new £7.9million Energy Research building that will become a centre of excellence, nationally and internationally, for research into low-carbon technologies. This will include sustainable use of fossil fuels, carbon capture, biofuels, material recycling, and transport policy. The facility was built using heavyweight concrete, which is a key factor in the passive sustainability design and construction of the building. The concrete will remain exposed in order to maximise the potential of the material’s thermal mass properties and reduce the need for air conditioning. In line with this requirement, CCL designed and installed post-tensioned slabs incorporating its XF system, which reduced floor thickness whilst maintaining fair-faced soffits. It is intended to be the ultimate in energy efficient design, incorporating solar hot water generation, an on-site combined heat and power station for conversion of waste heat, occupancy sensors and demand driven ventilation. The building is an extension of the original engineering complex and it is estimated that 170 researchers and students will be based there. CCL’s total contract schedule ran from August to November 2010.